The sun sets on several thousand gathered in Taipei. Police stand guard with riot shields and batons blocking roads and entrances. 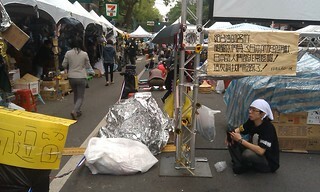 Streets overflow with students—some standing, most sitting on cardboard, Mylar heat blankets, or interlocking foam pads. Tents and booths line walkways. Traditional Taiwanese food vendors sit at the outskirts. Projection screens and stages can be found at the corner of every block, each with a different guest speaker. Sweepers patrol, armed with brooms and dustpans. The scene is clean. No one litters. Everyone is a volunteer but the police. 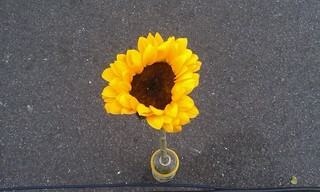 Sunflowers and yellow banners are everywhere.